Maybe we can start by establishing some background information. When did you begin working with ceramics? I took my first class in 2011, when I was on a residency at Banff, and then continued afterwards while studying at Columbia. I really wanted to do some sculptural work while I was pursuing my MFA; up until then, I had been mostly focusing on drawing and printmaking. So during my first year, I took a class with Jon Kessler, where we worked with wood, metal, and plaster. Then I took a ceramics class with JJ Peet during my second year. Why were you so eager to explore sculpture at the time? Well, when I first got to Banff, there were so many facilities, and I just wanted to try everything out. So, for example, I did some metal casting for the first time while I was there, just experimenting. But their ceramics department looked lived in and welcoming, so I decided to go in and try it. At first, like anyone, I made some really bad things on the wheel. But I liked the materiality, and I wanted to see what else I could do with it. So when I got back to Columbia, I took that class with JJ, who showed us more of the history behind ceramics and gave us various projects to work our way through the medium. He took it very seriously and structured the course as you would any other sculpture class. There were no wheels at Columbia, either - it's strictly hand building, which I enjoyed more. So from the outset, you’ve approached ceramics as a fine art discipline rather than a craft. Right. JJ would do slide lectures and glazing demos, and really set up the studio to be productive. Some of the readings were fairly scientific, explaining how clay bodies were formed and so on, but the same time, we were learning how ceramics fit into the lineage of art history. It’s interesting, because Columbia’s program always had one or two sculptors that would use ceramics, but there had never been an official ceramics course before – the class I took was the first one ever offered there. I think JJ’s involvement was important, because he works with a vast variety of materials and was a lot more open to experimentation than someone steeped only in ceramics. I really think that's why I started making the work I did. As you were fulfilling these assignments, were you able to explore your own ideas in the process? Oh yeah, the assignments were pretty open – we’d have to create some sort of drinking vessel, for example, but that could really mean anything. There were both undergrad and grad students in the class, and some students from outside the art department as well, so it made sense to keep things open. But yes, I was working through different ideas in these various assignments. Eventually, for the last one, I wanted to make these masks, where I’d take pieces of other people’s work that had been left on the studio shelves, either broken or abandoned, and combine them. So I asked JJ if I could re-fire some broken pieces of pottery – if that would physically work. He said that it would, as long as the pieces were fired to the right cone. Can you explain what you mean by “cone”? Cones are these little physical objects you’d place in the kiln along with the pieces you’re firing. At a certain point, the cones begin to slump and deform, which gives you a way of measuring the time and temperature needed for your work to be ready. So basically, what JJ meant was that my idea would work fine as long as I didn’t mix the wrong types of clay. Like, with the first one I tried, I accidentally mixed low-fire and mid-fire pieces, and the whole thing melted to the kiln shelf. So after that, I was more careful about what I used. Of course, now that a lot of kilns are electric now, you don’t really need the cones – you’d just program it. But with older gas kilns, that’s how you would test the temperature. That makes sense. So how did you arrive at this idea of combining pre-existing shards of pottery? I think I've always been dealing with fragmentation in my collage, drawing, and printmaking work. A lot of the sculptural works that came about at the same time were modular, meaning they could be taken apart and reassembled. For example, some of the prints I had been working on were chine collé, which is a type of collaging with Japanese gampi paper. 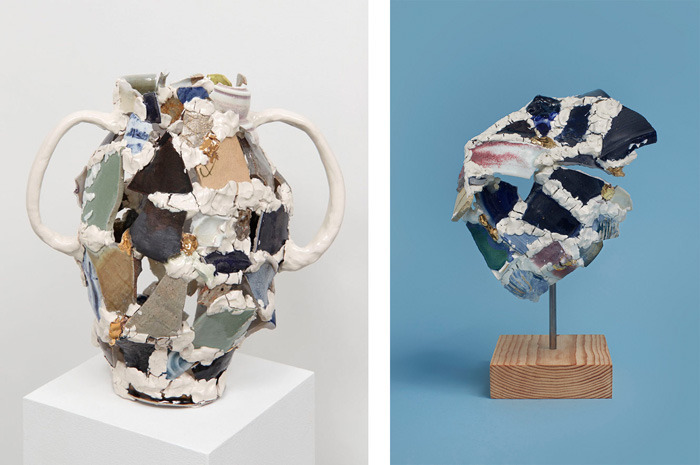 Of course, this idea of reworking the ceramics is not a new one – a number of artists have done it before. 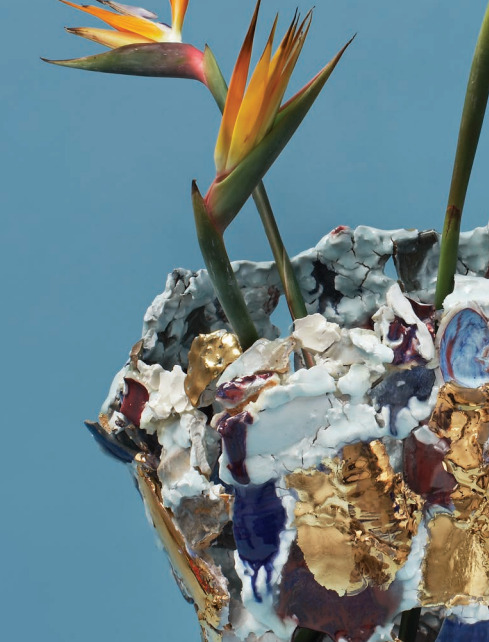 There was a post-war German ceramicist named Gertraud Mohwald, for instance, whose work is based on similar ideas; there’s also kintsugi, which is the Japanese art of mending broken pottery with lacquer and gold. I wasn’t necessarily familiar with either when I began working this way, but formally, I think they do relate. So like I said, the basic idea has been explored before, but to relate that technique to the body has felt really fresh to me. As I go through this discarded pottery, there always seems to be something that looks like a heel or a finger, a form that seems to relate to the body. So in using these broken shards, the work is translated into my practice. Kintsugi is also interesting because it’s a willfully aesthetic means of restoration – a way of giving broken or failed items a kind of second life through artistic techniques. That seems to be an important idea in your broader practice. Definitely. This theme of productive failure is one that runs through all of the work. It’s the idea of turning something negative and failed into a productive moment. Some of the drawings I’ve been doing with oil sticks function this way. Those are meant to be almost a pastiche on certain tropes from Modernism, which was a utopian effort that ultimately failed. So the ceramics just presented another way of translating these ideas. As far as kintsugi specifically, the overlap was unintentional. I’d already been working this way for a while when I was introduced to it. It was really just that I’d wanted to use a lustre finish on the works, which produces a sort of iridescent surface effect, because it made them feel more precious, more complete. But obviously, when you start combining broken ceramics with gold lustre, the comparison inevitably comes up. Have you always used same material to join the pieces, or did you experiment with different techniques? No, I’ve always used porcelain – not only for the texture, but also because it’s the most difficult to work with. What is it about that element of difficulty that appeals to you? The porcelain lets me push it to the limit. The more robust clays that people often use for building sculptures were always too heavy for my tastes. The porcelain is unique, because it has really fine particles, so there’s this great texture, but it also slumps and falls apart more easily. I’ve been mid-way through a work, having fired it, only to see it fall apart in my hands while moving it. Also, as they’re being fired, the works crack and break. They gain personality. I can't control those effects, either; it’s always a surprise opening the kiln. So the sculptures are very finicky that way. Of course, once you glaze the works, they are very strong, as glaze is essentially liquid glass. But before that point, the process is much more delicate. It’s really not even supposed to work, but it does. I like that. In terms of presentation, you typically mount the works on a steel rod rooted in a pine wooden base. How did you arrive that that mode of display? I looked at a lot of other sculptures as I was doing my research, and this just seemed to be the most practical and efficient way. I think the pine is a nice counterpoint to the coldness of the ceramic, and I like how the steel counters how fragile the work can be. Also, doing it this way also means that the work can be taken apart, which is great for shipping – and, on a pragmatic level, it’s nice to be able to break down the work for storage when you’re living in a tiny apartment in New York! But as I said, I really like modular works. I think about Gilbert and George a lot in these terms. I like that their pieces are always framed, but they can expand to fit the venue space and then be compressed down for shipping. It's such a nice way to think about the works and the way they live after a show. The chine-collé prints I mentioned worked that way, and the ceramics do as well. So as you’ve been developing this body of work, who have you looked to as reference points? Lucio Fontana would be one. He had these playful forms that seem so natural. I was also looking at Rosemarie Trockel's work a lot. I think her practice is similar to mine, in that she works in so many mediums, and I like that she is so precise with both the curation and display in her exhibitions. I actually had a professor that was working on a text about Rosemarie at the time, so we heard a lot about her. It was also around that time that the New Museum had a retrospective on her work called A Cosmos. That was a great show; I loved the floor with the books, and then there was a whole room of ceramics. Now that you’ve completed your studies at Columbia, where are you producing your sculptures? I work at a collaborative space in the West Village called Greenwich House Pottery. It's been operational since 1910, so there is a huge amount of history there – like, Lee Krasner took classes there, and apparently Jackson Pollock worked as the janitor at one point. Coming out of an MFA, I didn't have a dedicated studio, and I still don't. But being able to rent time at Greenwich House has allowed me to produce a lot more work. We established earlier that you generally view ceramics in terms of an art historical lineage. I wonder, though, if working in that environment has gotten you thinking about how your work might fit into ongoing conversations in contemporary crafts? Not so much. I feel like I look at all sorts of work, and there is a gallery at Greenwich House, which I will meander through from time to time. By seeing what goes on there, I’m exposed to other kinds of work, but I don't think I could speak to what’s happening in the larger contemporary ceramics realm. I mean, there are purists in the genre, and then there are artists that use it as a tool, as a medium. I'm probably the latter. For me, the medium is interesting because it’s able to translate a specific idea, to fit the concept. That's what I look for in a material, and why I work in so many different modes. I don't like the idea that that artists have to be rarefied to fit within a genre, but I know that it happens so often – like, “He's a painter, so he can't do performance,” or “She does ceramics, so she works in crafts,” or whatever kind of subjective stereotypes exist. I think being an artist, you look at the world differently: you are in tune to environments and materials and subtleties that others might miss. For me, that's the role of the artist - to uncover those moments that one might miss, to force yourself to pay attention. I feel like I can do that through ceramics, so that’s why I work with it. Any thoughts on why we’ve seen such a pronounced interest in ceramics within art circles in recent years? I think, like anything else, these things come in cycles: when something is uncool or outside of the conversation for a while, it gradually starts feeling fresh and different and new. The same thing’s happened in past years with figurative drawing and abstract painting. But there’s also been a shift in contemporary culture, I think, towards slowing down and embracing the handmade, knowing where our foods and household products come from, and so on. I think ceramics fits into that kind of thinking. As far as making ceramics goes, it’s also a really addictive process! It’s constant - you can't just go in and make one, it’s a whole push to get the thing to the kiln. You have to wait for things to dry, then bisque and fire and glaze. It really becomes a whole cycle to keep the work going. 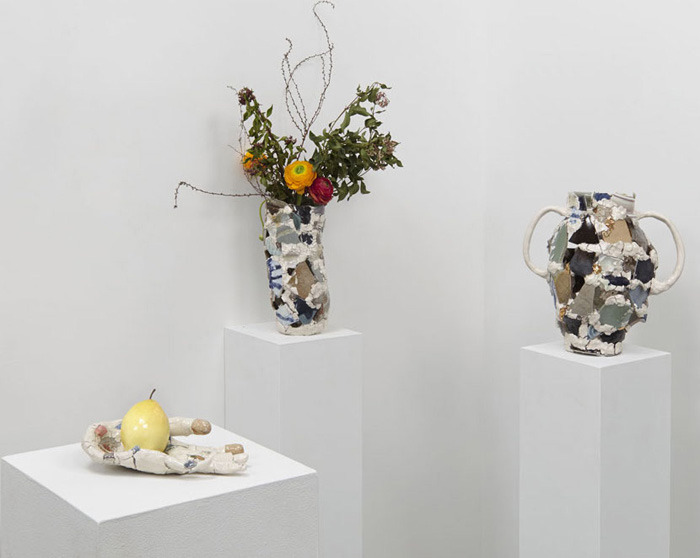 But given ceramics’ prescribed status as a craft medium, are you at all surprised at how smoothly it seems to have been integrated into these fine art conversations? Well, I wonder how smooth it’s really been. 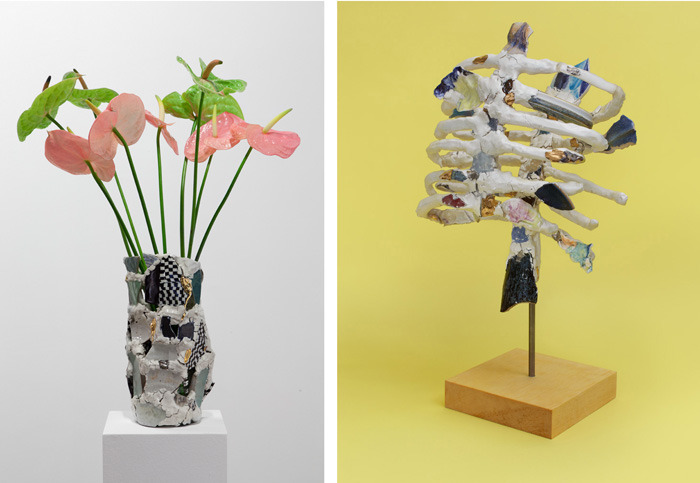 On one hand, maybe it comes from a few more established artists using ceramics. I do think there are artists pushing the medium, using it in different ways. At the same time, though, there are still a lot of people that work in the margins. I think a lot of it’s about how the work is packaged and sold. It’s about the context. 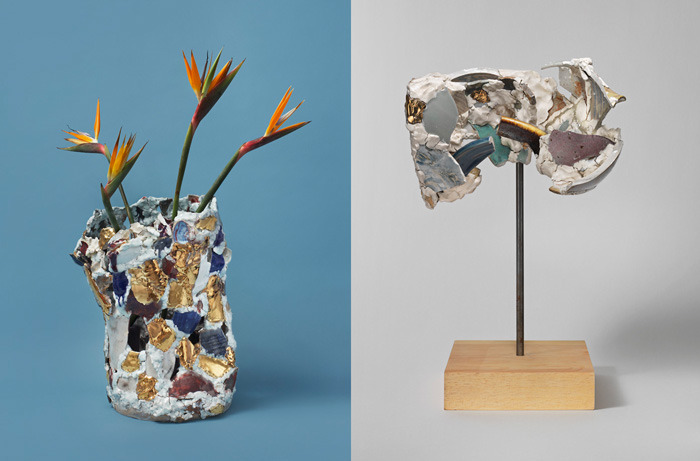 For a lot of these lesser-known ceramicists, if you were to put their work in a Lower East Side gallery, it would probably sell. It’s just not placed in that context. Of course, there are exceptions. For example, there’s a woman who works at the studio named Alice Mackler. She’s about 83 years old, has worked at Greenwich House for many, many years, and she was recently embraced by some of those galleries – she was included in a group show at James Fuentes through Joanne Greenbaum and was recently given a solo show at Kerry Schuss. It’s great work, totally off the wall, but I think a lot of why she’s found these opportunities has to do with this element of discovery, the story, the whole package. So it’s not really about being established or not; it's about another artist saying the work is good, vouching for it and switching the context. I think that you can see that happen all the time in biennials and all kinds of surveys. For me, though, working with ceramics in light of these things has definitely cemented an important idea: there will always be trends, with different kinds of work going in and out of fashion, but the true artist will always keep producing for the sake of it.